How big is the Biggest hard drive? Hard drives are fascinating items don't you think, the disks are more stable at high speeds than CDs but are more fragile than CDs. Also will intel core I7s eventually become more low end than the celery is now? And why are hard drive platters shiny? See More: How big is the Biggest hard drive? All CPUs will eventually become low end as technology advances. It is not a matter of if, just when. They need to be because of the tolerances mentioned a above. A hard disk read/write head "floats" above the platter at a height of about 3/5 microns. If the disk were not perfectly smooth, and therefore shiny, the head would be crashing into the disk all the time..
Just to give you a comparison, a human hair is about 10 microns. One of the first computers I ever used had sets of platten's on what they called a drum but really it was a set of platter or plattens on a holder. Each disk was about 24 inches across. Maybe 5 or so on holder. You had to call up the computer site and ask them to change drums to get to your data. 24", thats bigger than the TV in my room. Celerys became low end as soon as pentium came out which was not that long. › [Solved] Laptop password and hard drive security bypass. › what is the best website for asking computer questions? › Is the government building secret bunkers? "24", thats bigger than the TV in my room. Not unreasonable on the old main frame computers. Btw, something else called "drum storage" was often used for telephone exchanges. I think that was a hold over name from the 50's or so. Well the biggest i,ve seen in my hands is a 3.5", i thought the biggest ones were 8", guess i was wrong. I obviously can't speak for jefro but what I was referring to was mainframe computers which took up large office spaces where there were hugh boxes (peripherals) such as tape drives and exchangeable disk drives. The latter were multiplatter and were lifted in and out as necessary. I've been away from mainframe stuff for donkeys years so I've no idea what they are now about. Mainframes most certainly still exist though, in some form or other. In the UK they are used for massive number crunching processes, such as weather forecasting. As far as PC's are concerned, yes, I quite accept the general ideas in post #6 above. No idea (too long ago LOL) but by todays standards it would not be very much. To give you an idea, some of the work the old mainframes did could now be comfortably done on an upmarket PC, or maybe one or two linked together. That is why mainframes are now only used for massive processes. Far more powerful than meagre PC's. Yea but they still can't get the weather right most of the time, they should put supercomputers like that to better use than wasting it on weather forecasts that are right half the time. How much would a modern day high end CPU compare to the old 'supercomputers'. I think you are talking about daily domestic weather forecasts. Although they are constantly trying to improve those particular predictions it's a near impossible task. They do a much more valueable job for shipping and aircraft which is really their main purpose. You can rest assured that governments would not fund them if they did not give value for money. Meteorology, of course, is not the only use for a supercomputer. I really can't remember capacities for old mainframes. I assume Google would find the answer for modern supercomputers if you give it a whirl. Why don't they combine a few Supercomputers to make enough power to find more planets and stuff like that? The limiting factor, as always, is money. Yea, but they are using them to find out how the universe became how it is know, there are probably less looking for planets with intelligent life, this is starting to turn to science, even though computers do have some science in them. There's quite a bit going on in terms of looking for planets with intelligent life. Supercomputers are darned expensive so (assuming they are not already using them for that purpose) it comes back to money again. Everyone has their own pet ideas on what we should be spending it on but only governments hold the purse strings. Without looking at the past we would never have known enough to even start looking for the signs of intelligent life, so the two go hand in hand. As for weather forecasting, you will never get it 100% right. Probably 70% is is good average and to improve on that takes huge amount-of computing power. But as Derek says, it is the overall weather patterns that matter for ships and aircraft and they can be remarkably accurate. The reason for this is the the weather is a chaotic system; if follows the rules of chaos theory. Which basically they mean that very small changes in input can result in huge changes in output. Commonly know as the butterfly effect. It is getting all those small difference right that makes weather forecasting so difficult. Yeah. In fact we are probably a bit unfair about daily domestic forecasts too. We moan like heck when they get it wrong but forget how often they get it right. A CDC Hawk 14 inch drive contained 10 megabytes of data 5 MB on a fixed disk and 5 MB on a removable cartridge and weighed in the neighborhood of 150 pounds This was in the late 1970's. How much energy did the motor draw, did they use AC induction motors? I assume in the 70s 10MB is like 1-10TB in our days. Maybe wizard-fred will pop back. Dunno myself but it might have been a "synchronous motor", as this would avoid the need for speed control (bearing in mind the stage of depelopment of control electronics in those days). Whatever, I doubt it would have had brushes because of wear out issues. And brushed motors are really noisy and get too hot because of friction between the armature and the brushed and the armature acting as a transformer secondary shorted gives out heat and so does the field windings. In fact I took issue with #22. It is either misleading (badly worded) or their knowledge of physics leaves something to be desired. Well i got a c, what was misleading Derek? Well, as I'm sure you've experienced, static is most noticed during the winter in a heated room. This is because the Relative Humidity (percentage saturation for everyday practical purposes) is low. "Which of the following conditions most increases the likelihood that ESD will occur?" Their answer C (cool, dry conditions) is fine if you assumed that they were talking about "outside weather" conditions with the equipment inside a heated room. If you assumed that they meant "inside conditions" then answer A would have been correct. Not many folk have their equipment outside so that could be a reasonable assumption. If you cool the room down in winter, the RH increases and ESD therefore decreases (despite it being both cool and dry indoors). Yea i get your drift, i ticked b ,because in the summer you get damp because you sweat and when you feel hot you put a fan on, open a window or put the A/C on, which in a way makes it damp and cool conditions. By the way how old do you think i am? That depends on how you define A/C. To me it implies temperature and moisture control plus filtering. Most folk IMO use the term wrongly to describe just cooling and heating. Another problem is the definition of "dry". This can either be taken as RH (as already given) or Absolute Humidity (moisture content). Quite different things but related to each other. Whatever, damp and cool would help prevent ESD on both counts. For "outside conditions" you are almost right because the moisture content of the air is low in winter (it condenses out on the external surfaces). I think C is closer though and I would accept that if the question was suitably reworded. As for your age, that's something I'm sure to get wrong. You come across as young but your English is good (sometimes a confliction). There was a 14 year old around recently but I think that was "RMT2". I could take a fairly low risk bet on the possibility that you are younger than I am, but really I just don't know. Well i am 1 year younger than RMT2, i have heard if him before on the intro post. Gonna be the same age as him this year. Don't know if thats a bad thing or not. .... and I'll be 76 in September. I "know" that's a bad thing LOL. The good thing is that all age groups can participate and offer something in these forums. Well, its not that bad, at least i don't think it is. Yes but isn't there a rule that you have to be 13 or over to post something, i don't know but i read it somewhere on here. Well, I don't recall seeing any such a rule on here, although I might have missed it. By the way, I'm still learning - it never stops with computers. Anyone who says they know all about computers is kidding themselves (whatever their age). Look at the bottom when your about to post a question it will say- By posting on this site, you agree to abide by the rules, and confirm you are over 13 years of age. So a 12 year old who wanted to ask a question about something would be breaking the rules. Who says that they know everything about computers, they probably don't know the difference between SATA and IDE or PCI and PCI-E.
"It's a hard disk drive back in 1956... With 5 MB of storage. In September 1956, IBM launched the 305 RAMAC, the first 'SUPER' computer with a hard disk drive (HDD). The HDD weighed over a ton and stored a 'whopping' 5 MB of data. This was sent to me by a friend of mine and I have no idea where he got it from. 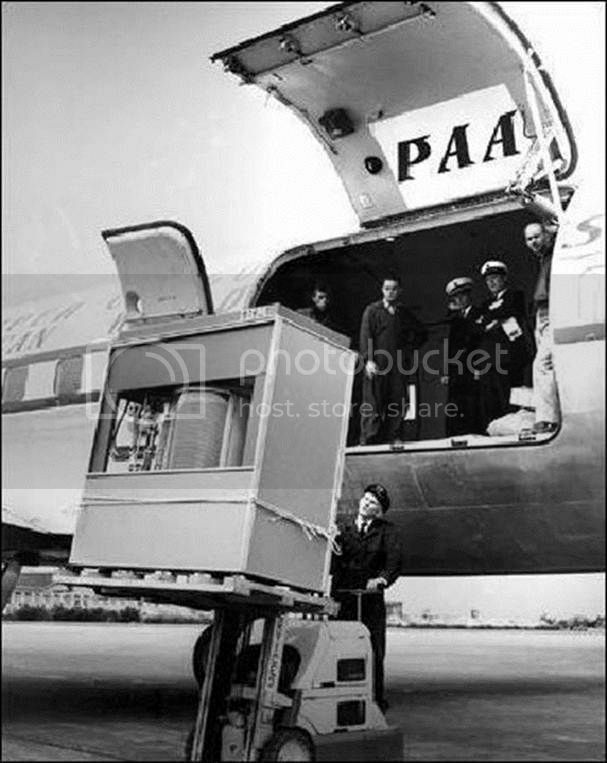 Yea i saw those pictures before Ewen, they needed a helicopter or airplane to carry one of those, these days 100s of hard drives that are 1TB can fit in one airplane, man technology advanced quickly. How much would those of cost? That figures, it's a long time since I posted a new question. Somewhere buried on this forum is a list of rules from the webmaster. I used to know where but they don't exactly pop out and grab you. What I assume to be a precis was given fairly recently as the top thread in The Lounge. Good catch that! Any advances on 36 inches? My first computer had a 20M HD - well, the first one with an HD at all. Late 80's I think. You must be one of the newer fellahs (quote from movie "High Society"). The worrying thing is I regard that movie as one of the newer ones (only 1956). You had a hard-drive in your first computer?... you're lucky, I had a tape drive (Vic 20). My next one was monumental step forward, an Amiga with TWO diskette drives, upgraded from there to MS3.1 with a 420M drive. PS: I think we've hijacked the thread! clarifying some of the comments regarding mainframe computers. Drums are not disks, and I doubt they were exchangeable. They had many read/write heads, which reduced the mechanical movement (over a single head) needed to locate the data. Because of this the speed of the operation was increased. Disks were fixed or exchangeable, some with very low capacity compared to today e.g. a single platter about 15" diameter held 5 million characters. The picture Ewen (#32) links to is an example of an IBM fixed disk unit with the platters mounted vertically. I would think these are not that large, whereas platters mounted horizontally could be 36" diameter, maybe more, and these surely would be (physically) the largest made. There was an attempt to introduce an exchangable disk that included the read/write heads, all enclosed in a perspex casing. It did not catch on due to cost - a silly idea really. It was called a Winchester, and this term was used during early pc days for their hard disks which were fixed. Exchangable disk packs were expensive, but fast when accessing data, whereas tapes were vastly cheaper. but slow accessing data as they had to be used serially. Here endeth todays history lesson. Ewen, LOL, all of my computer have hard drives because i was born in the late 90s, the smallest hard drive i have seen 2.1GB, and I've had a memory stick that was 64MB and i have a 120MB memory stick. Are the tapes your talking about the little music cassettes you put in stereos or the ones people use for video or at least used to. Did floppy disks come out in the 70s or 80s forgot which one? And about perpex casing, maybe they wanted it to look cooler? Computer tape drives are like this one. More like a reel-to-reel- tape recorder than any kind of casset. The nearest thing you will get to them in appearance are the 35mm film reels used in the movie theatres. Floppy disk were invented in the 70s. I was using floppy disks on a TRS-80 in 1979. The 5.5" disks were single sides and had a capacity of 200 kBs. The TRS-80 Mod II had 8" floppy disks. "Hmm, i guess 8" floppys were big like a 8" speaker"
First job I had out of tech school (1980), I worked at a manufacturing facility where I used 8" floppys to store and retrieve test programs. They were leaps and bounds ahead of the paper-tape and disc packs that other machines used there. 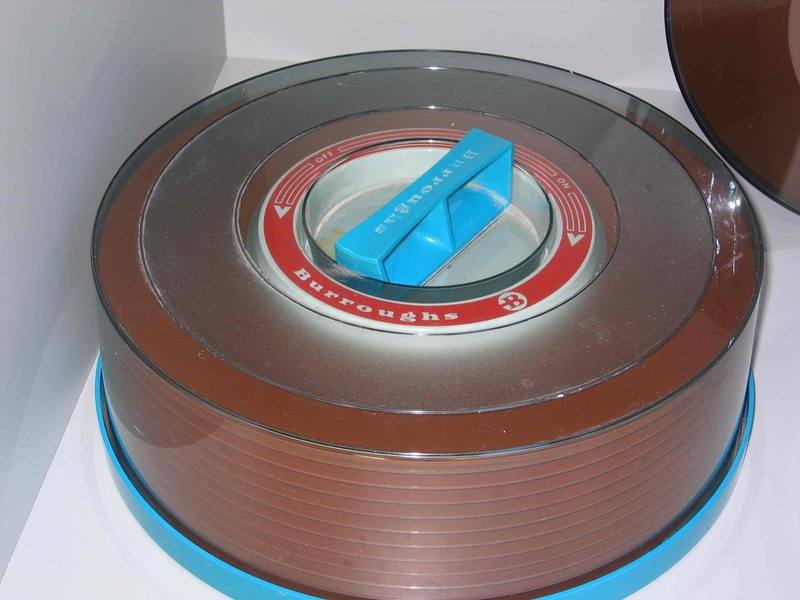 Paper tape, never seen that in computers, what was the last pic, hard drive platters or something? I once did some acceptance testing of a computerized telegraph message switching system (Hasler - Swiss firm, long since bitten the dust). If it crashed badly you had to load the software back using paper tape. Clearly the technology has changed dramatically but the basic principles remain much the same. Like windows 7 crashing badly then you have to reinstall? @jay_nar2012: Glad to see someone else my age around here :). It's good to see a wide age group on these forums. Everyone has something to offer. To RMT2, me too, thought i was the youngest guy on the site. @Derek: A very true statement. Well thats one thing to be proud of i think RMT2. So if i'm the youngest guy on the site, whos the oldest, Derek don't say its you! You know the new internet explorer advert, whats weird about it is i don't like IE but i like the song. The old 14 inch drives had induction motors and large fans. The heads were moved by a speaker-like voice coil mechanism with an linear optical encoder. Quite fast 35 msec track to track. The next generation had 5 fixed and 1 removable disk with a capacity of 15 MB per disk. They also made 8 inch floppies with voice coil mechanisms. Why did floppys need voice coil mechanisms? This was before steppers were perfected. Voice coil for speed in head positioning. The mechanisms were heavy and large. Magnetic gap had to be longer than the stroke. Voice coil mechanisms allow for a higher track to to track density as the head can be positioned more accurately with a continuous positioning mechanism, This allowed the the heads be positioned anywhere on the disk with on-the-fly adjustments if necessary and they are faster than stepper motors. Stepper motors have number of predefined steps with nothing in between. This is why you sometimes get the case where a floppy disk formatted on one drive cannot be read on another because the heads are slightly misaligned. A voice coil can mechanism can accommodate such minor discrepancies in track positioning,. For the amount I paid for an 5.24 inch floppy drive with a capacity of 759 kBs in 1980, I could get a couple of 1 TB hard disks to-day. By 1985 the price would have dropped by at the three quarters once the IBM PC hit the streets. For the most part you guys are way over my head. I remember the old paper tape but never had anything to do with it myself. I think it was the late 70's a friend had a brother that worked for I believe a subsidiary of IBM. He only went to the office or whatever two days a week the rest of the week he was in his computer room at home. The first time I went in there the only thing I recognized was two desk fans, a window unit a/c, and a coffee pot oh and a chair. Everything else was some part of one of several computers in there. I think he was some sort of programmer. He had boxes of the paper tape and threw away a lot of it. When he did leave to go to work he took a few boxes with him each time. I did mess with systems that had either the old tape drive or eight inch floppy but I never really did anything besides look at them and say to myself "what did I just do?" The first computer I actually accomplished anything on had the five and a half inch floppy. It was in the auto shop class I took in high school. I used it for inventory and pricing. There was if I remember right some sort of game we could play on it but it took so long to set up and load it wasn't worth our effort. 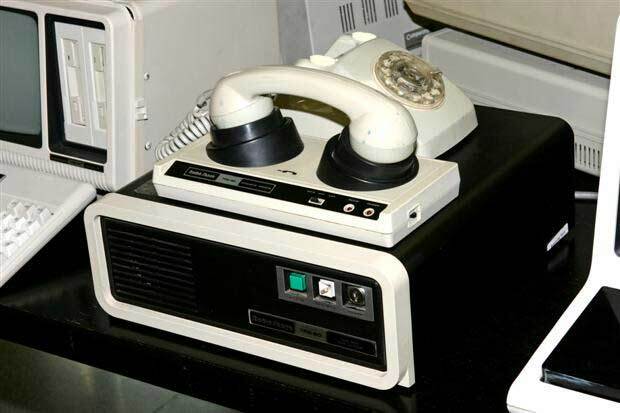 It had one of those big modems (not sure it was really a modem) that we had to lay the hand set of a phone in and dial a number on the phone to connect to the school’s mainframe or database. So the modems were bigger than they were today? And on stepper motors, why didn't they wind smaller coils and put in more coils to make more steps? "So the modems were bigger than they were today?" First one I used was 2400 baud (internal) and it took over 4 hours (with long-distance charges racking up) to download Doom II on Compuserve CIS for MS-DOS. In the picture is the black box thing part of the telephone or is it separate? @jay_nar2012: To me it looks like the black box is the modem itself. That is a BIG modem if it is one. "That is a BIG modem if it is one." Oh, i though that was a modem, so its a external hard drive for the modem, why did a modem need a storage device? It's an external hard drive for the TRS-80, not the modem. @T-R-A: Why does a modem need a external storage device? @T-R-A response #63 Our modem was rather close to that. I have no idea what the baud rate was but when I had to transfer data at the end of the day it took almost 45 minutes to complete and if I remember right ther was a local toll charge for the call across the parking lot. I've got one of the old TRS-80'S I think it's a model 2 though out in my shop. It worked (in as much as it would power up) when I got it at a local estate sale for $5. Been a couple years though. It came with several floppies but most appeard to be damaged. Radio shack had an operating system? Cool, and whats with the skeptics website? "Radio shack had an operating system?" IBM tried to recoup the hardware market it had lost to clones with the PS/2 line in 1987, but reception was tepid at best. It did have some advantages, but even those were implemented into other hardware from other manufacturers. Clones?, sounds a little like cloning animals but instead your cloning PCs. From what little I remember or actually knew at the time it was like there were no patents or copy write laws. There were a lot of so called computer manufacturers and software creators. It sometimes appeared they would buy say an IBM computer, take IBM’s logo off of it and put theirs on and sell it. Same with the software coming out. Don’t quote me but I believe what was going on is that those that did the actual work, the developing, the coding, etc…etc…their numbers were small (not many of them) and they more or less got around and worked for everyone. At the time things were changing constantly. New companies coming in and others falling by the way side or just not being the top dog this week. Those that could put an idea into practical design moved around hoping to stay with the top company but most often that “top” company would fall soon. Keep in mind this all is not truly what was going on. It’s just how it appeared to me as a preteen and teenager. I knew of one person that in a span of five months worked for nine different companies but they were all owned by IBM. I also knew a few others that bounced about for over four years. My parents and other “old people” were all saying “You have to get into computers. That’s where the money is.” What I was seeing though were folks a few years older than me getting shiny new cars and houses and the great new technology company they worked for disappearing. At the time the idea of being involved in that scared me to no end. "It sometimes appeared they would buy say an IBM computer, take IBM’s logo off of it and put theirs on and sell it." "At the time things were changing constantly. New companies coming in and others falling by the way side or just not being the top dog this week." Since then, Cyrix has fallen by the wayside and the development has been towards multi-core CPU's. There's more computing speed available out there than most home-users really need, but that's just my opinion. It sometimes appeared they would buy say an IBM computer, take IBM’s logo off of it and put theirs on and sell it. Same with the software coming out. They wouldn't have to. When the ICM PC was for designed, one of the design criteria was that the development costs would be kept to a minimum as the IBM Management did not think there was much of a futures in desktop PCs. Hence the use of the 8088 CPU which only required cheap 8 bit support components, while the more powerful 8086 required 16 bit support components which at that time were relatively new and still expensive. It was not until Phoenix developed a clone BIOS that companies where able to make IBM clones, and in some cases, a lot cheaper than the original. They way it was done was the there were two teams of developers. One team dissected the BIOS code and worked out all its functions. This information was then passed onto the Phoenix programmers who then wrote a new BIOS having never set eyes on a single byte of IBM code. This way it eliminated any possibility of being sued by IBM for copyright breaches as the code was totally different although it did the same thing. One of the early tests for IBM Compatibility was MS Flight Simulator. Because it was graphic intensive and for speed used the BIOS graphic facilities it had to run on a BIOS that preformed identical to IBMs. Don't forget at this time Microsoft and IBM where still the best of buddies. Did, tesco. sainsburys or any of those have there own OS? There's more computing speed available out there than most home-users really need, but that's just my opinion. I'd be willing to bet that is more a fact than opinion. I'm thinking we hit the limit of what the average user needs around seven or eight years ago. I know I have way more than what I need and I do a good deal of video editing. My bottleneck is my connection (simple dsl) from my ISP. The drums we had were called drums at the time. I was only a kid so I can't verify that it was the correct name. It was only the name the BASIC program teacher called it. We couldn't afford a computer in our school so we had to dial up to the county college. The thing we asked was to change drums so that we could run a program. We did get to see the actual drum and it was a set of maybe 20" or so wide group of normal new type hard drive plattens. They were in a sort of glass or plastic housing.